katiemaytoo quilts: it's not my fault! I DID sew all those pieces into blocks. I DID sew the blocks into rows. And then yesterday I DID sew the rows into a whole top. I'm working on a #2, too....remember the grey and red one? Still only 3 blocks there. That box is going to fit ALL my scraps when I'm done. I'll just keep sewing until it fits. 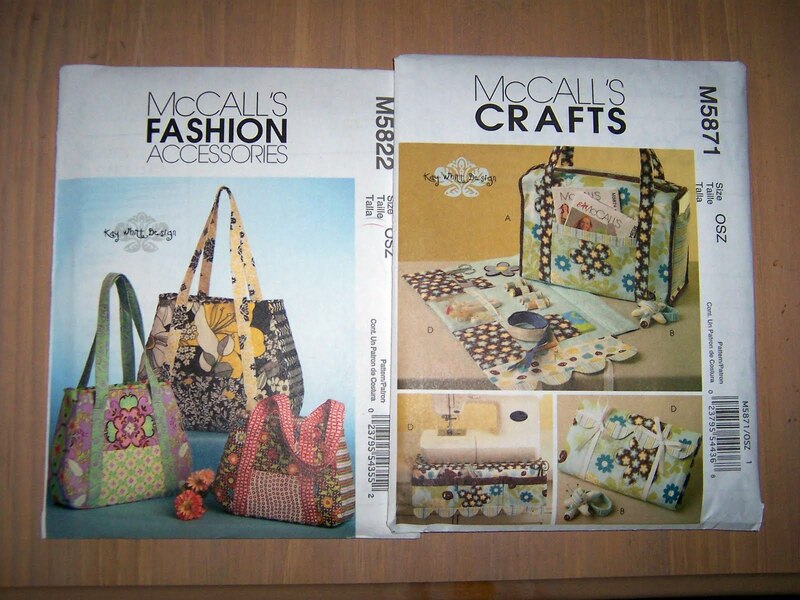 I also got these at JoAnn's because McCalls patterns were 99 cents. They should help a little with my stash reduction, don't you think? My mom was with me, but I think I may make that little caddy that sits under/in front of your sewing machine for Mother's day. 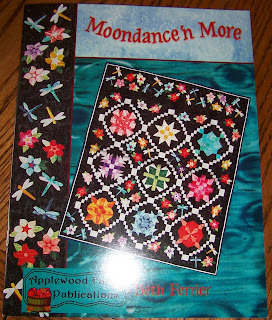 Beth Ferrier (the author - my flash kinda obscured her name) was the speaker at the quilt show I went to a few weeks ago. This book looks right up my mom's alley. And inside they have pictures of the quilts with their OWN kitties posing! How could I pass that up? I even had Beth sign it for me/my mom! I made it using the Spring Posies tutorial as a guide. My blocks are smaller and the yo-yos sewn on a little differently, but I have to give credit for my inspiration. It finished about 18 inches square. Well, the groceries are bought, lunch will be quick and then I can maybe sew some today. I'm feeling better, but have a nagging headache. The plan for this afternoon: more red and grey wonky stars for the 2nd scrap quilt AND working with more of the fabrics Mary sent with her exchange blocks. Maybe a nap, too. Yay! 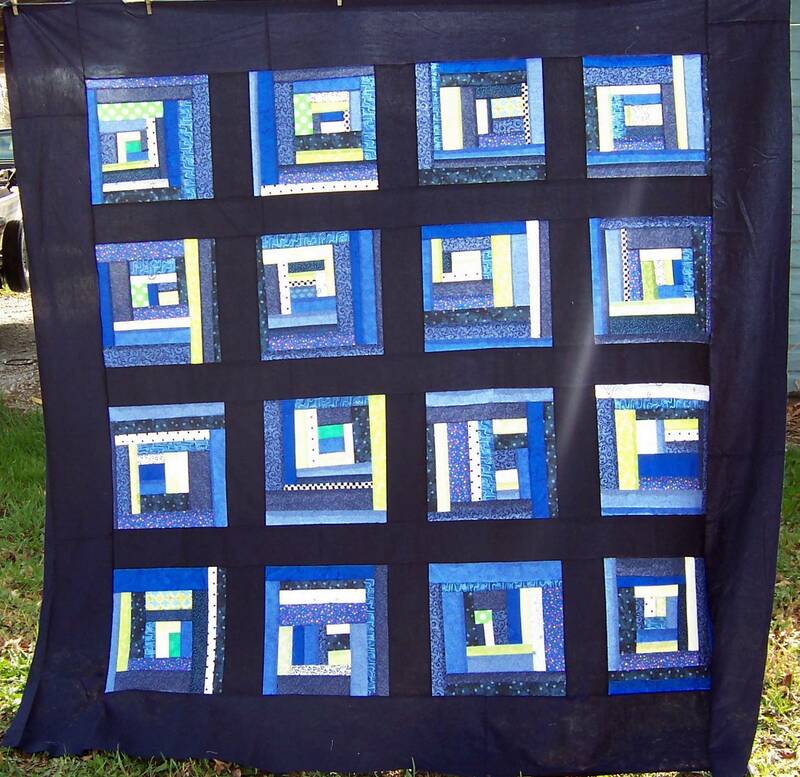 Your blue scrap quilt turned out beautifully. 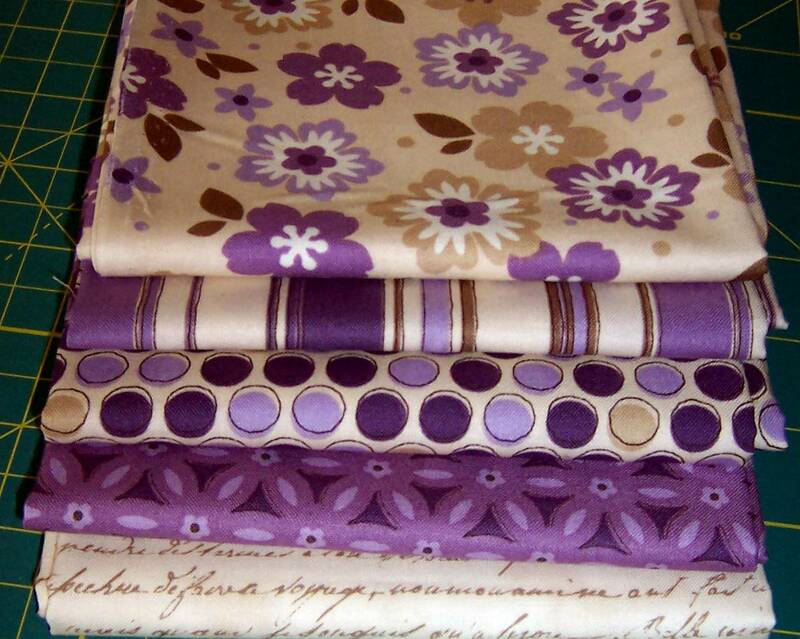 What are your plans for those lovely new fabrics? Sounds like you have plenty of projects coming down the pipe. I'm with you about battery operated toys. I cringed every time my kids received some. They really got much more imagination out of less "techie" toys. I'm sure the doll and qult will be loved though - it's easier to attach to a doll, even minus the original giggles, than to a remote controlled whatever. 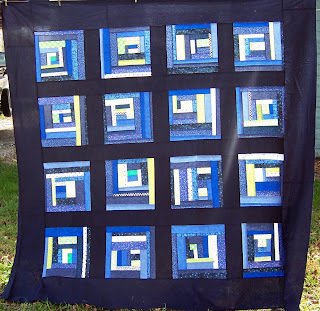 Your scrap quilt is fantastic. I really love using the bright colors with black for the sashing and borders. It really makes the colors pop! Your new fabrics are great, can't wait to see what you make with them. I love the dolly quilt the little yo-yo flowers are so cute. 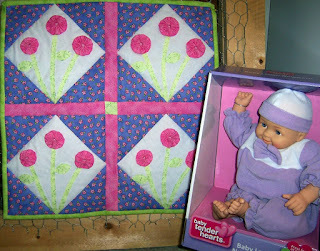 With a nice quilt to wrap the doll in there is lots of make believe opportunities so batteries may not be missed at all. The bag pattens are great and I'm sure you Mom will be thrilled with the sewing caddy, especially since it is made by you! Enjoy your day and I hope you get to sew a lot. Happy Birthday to your mom!!! Sounds like you had a fun time shopping and came home with a ton of goodies...it all looks so fun and wonderful. You also made a darling quilt. I must admit that when I saw those first blue scappy blocks, I thought (as Ann Hermes said in her blog) "What was she thinking?" *grin* But the quilt is beautiful and unique! 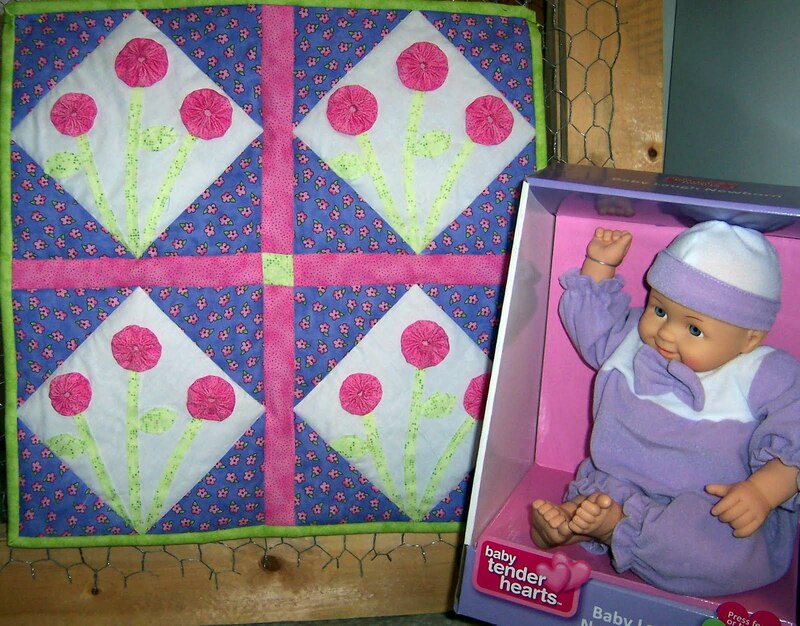 The baby quilt is cute too. It's easy to see you truly do enjoy your quilting! ---"Love"
Katie, I read your comment on my blog about your husband's "approval" of your blue scrap quilt, and I agree with you, your quilt is "Perfect" ---really! I thought I approved the comment for publication, but I don't see it anywhere anymore! I thought there were six comments I approved, but see only four; where did the other two go??? They are no longer on my list awaiting approval either. I wish I could remember whose the other one was. Oh well!! ---"Love"
Your scrap quilt is beautiful. I can't believe you are on to another one alredy. Your dolly quilt is so cute. Each new one becomes my favorite (LOL). I hope your headache is gone and that you are feeling 100% great.